Many consumers reach a point in their lifetimes when they have too much debt, particularly credit card and other forms of unsecured debt. Fortunately, there are potential solutions for people who are overwhelmed by debt. Two popular options for handling debt and credit problems today include debt consolidation and debt management. Debt consolidation is the term used when people consolidate all or the majority of their debts into one loan with a relatively low interest rate. Some consumers select to transfer their credit card balances to one credit card with low interest. Others will apply for a debt consolidation loan or, in some cases, a home equity loan. Under the right circumstances, a debt consolidation loan can be helpful. Debtors can search for loan terms that will offer a monthly payment that is lower than the combination of all their other loan payments. The debt is easier to manage since only one bill needs to be paid each month rather than sending out multiple payments. Unfortunately, debt consolidation frequently facilitates rather than helps people with their financial problems. Consumers sometimes use a loan as an easy fix without working to improve their overall credit and spending habits. Debt management can be a better option once a person locates a reputable company. There usually are several components to a debt management plan. While a debt management company can help individuals to work to pay off their unsecured debt, these services typically are for people who have $10,000 or more in credit card debts along with other unsecured debts. A debt manager will work with the consumer to determine the total amount of his or her unsecured debt, as well as the amount of other debts and payments each month. This will be examined in comparison with the individual’s income in order to determine how much money a person has left each month that can be used towards paying off the overwhelming debt. A debt management company will contact a person’s creditors after reviewing that individual’s financial status. Generally, debt management companies are able to negotiate payoff plans with credit card companies and other creditors. In fact, they are trained to help people receive a reduction of the interest rates they currently are paying or previously were paying. Sometimes a company even will remove the interest all together if a person is able to pay off the settled balance in a predetermined amount of time. 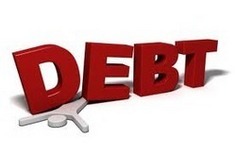 Debtors will pay the debt management company a set amount each month. From this amount the company will pay its client’s creditors and remove any of its own fees. These companies also work to help people improve their spending and financial habits. The goal is to make certain that clients never find themselves in deep debt again.